Austempered Ductile Iron (ADI) is a type of ductile iron that is characterised by increased toughness, tensile strength and wear resistance compared to normal ductile irons. These properties are achieved by heat treatment of an alloyed ductile iron using an austempering process. 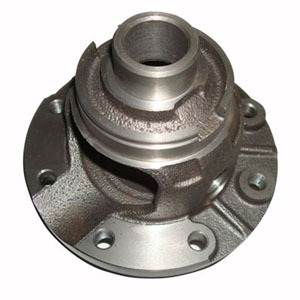 The mechanical properties of ductile iron and ADI are primarily determined by the metal matrix. The matrix in conventional ductile iron is a controlled mixture of pearlite and ferrite. What material offers the design engineer the best combination of low cost, design flexibility, good machinability, high strength-to-weight ratio and good toughness, wear resistance and fatigue strength Austempered Ductile Iron (ADI) may be the answer to that question. ADI offers this superior combination of properties because it can be cast like any other member of the Ductile Iron family, thus offering all the production advantages of a conventional Ductile Iron casting. Subsequently it is subjected to the austempering process to produce mechanical properties that are superior to conventional ductile iron, cast and forged aluminum and many cast and forged steels. 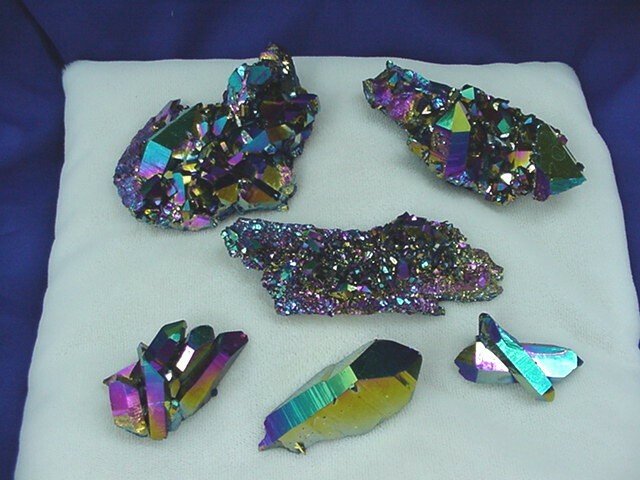 The properties of ADI are due to its unique matrix of acicular ferrite and carbon stabilized austenite called Ausferrite. The austempering process is neither new nor novel and has been utilised since the 1930′s on cast and wrought steels. The austempering process was first commercially applied to ductile iron in 1972 and by 1998 world-wide production was approaching 100,000 tonnes annually. Heat castings in a molten salt bath to austenitizing temperature. 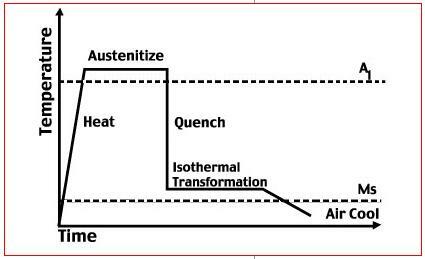 Hold at austenitizing temperature to dissolve carbon in austenite. Quench quickly to avoid pearlite. Hold at austempering temperature in molten salt bath for isothermal transformation to ausferrite. Austempering is an isothermal heat treatment process which significantly improves both the strength and wear resistance of ductile iron whilst retaining the impact resistance and ductility for which the material is noted. Austempered Ductile Iron was introduced in the 1950s, but it was commercialized and achieved success only some years later. 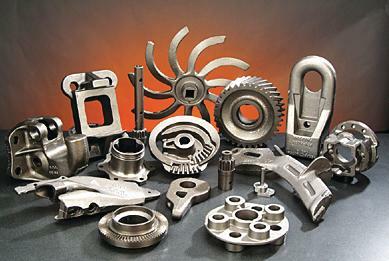 In austempered ductile iron, the metallurgical structure is manipulated through a sophisticated heat treating process. The austempered ductile iron makes parts with high strength, abrasion resistance, higher ductility and toughness. Initial austenitizing times and temperatures (1550° to 1700° F.) are controlled to ensure formation of fine grain austenite and uniform carbon content in the matrix. The precise temperature is grade dependant. Quench time must be controlled within a few seconds, to avoid formation of pearlite around the carbon nodules, which would reduce mechanical properties. Quench temperatures (450° to 750° F.) must stay above the point of martensite formation (except for ASTM A 897 Grade 5). In the austempering step which follows austenitizing, the temperature of the final salt bath must also be closely controlled. The austempering step is also precisely time-controlled, to avoid over- or under-processing. By the end of this step, the desired ADI ausferrite structure has developed. Ductile iron is not a single material but is part of a group of materials which can be produced to have a wide range of properties through control of the microstructure. The common defining characteristic of this group of materials is the morphological structure of the graphite. In ductile irons the graphite is in the form of spherical nodules rather than flakes (as in grey iron), thus inhibiting the creation of cracks and providing the enhanced ductility that gives the alloy its name. The formation of nodules is achieved by addition of nodulizing elements, most commonly magnesium and less often, cerium, into the melt. Yttrium has also been studied as a possible nodulizer. Austempered ductile iron is produced by heat-treating cast ductile iron to which small amounts of nickel, molybdenum, or copper have been added to improve hardenability. Specific properties are determined by the careful choice of heat treating parameters. Austempering involves the nucleation and growth of acicular ferrite within austenite, where carbon is rejected into the austenite. 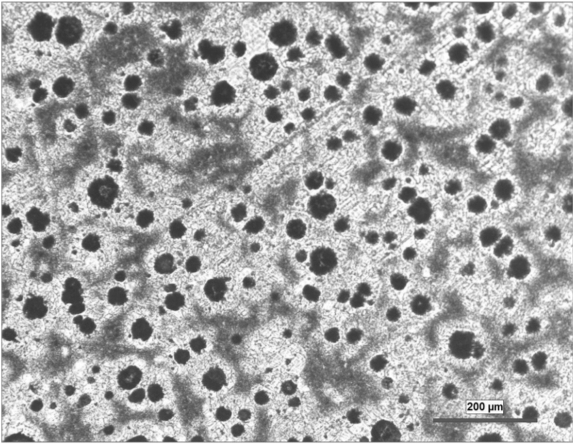 The resulting microstructure of acicular ferrite in carbon-enriched austenite is called ausferrite. Even though austenite in austempered ductile iron is thermodynamically stable, it can undergo strain-induced transformation to martensite when locally stressed. The result is islands of hard martensite that enhance wear properties. Advanced Cast Products uses salt baths for austenitizing, quenching, and austempering in order to achieve close dimensional control. Times and temperatures are tightly controlled throughout the entire process. Besides the requirement that the graphite be manipulated into the spheroidal shape, the ferrite and pearlite ratios can be controlled through alloying, shakeout temperature control or post-casting heat treatment to vary the relative amounts pearlite and ferrite from 0% pearlite and 100% ferrite, to 100% pearlite and 0% ferrite. 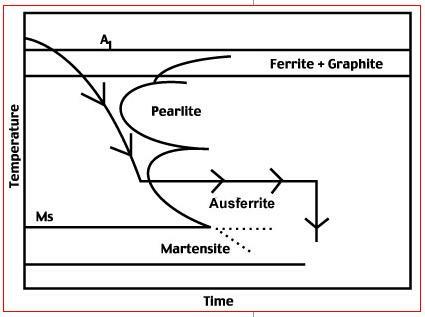 The control of the pearlite and ferrite ratio manipulates the tensile, yield and elongation characteristics of the ductile iron to produce numerous standard grades of material. 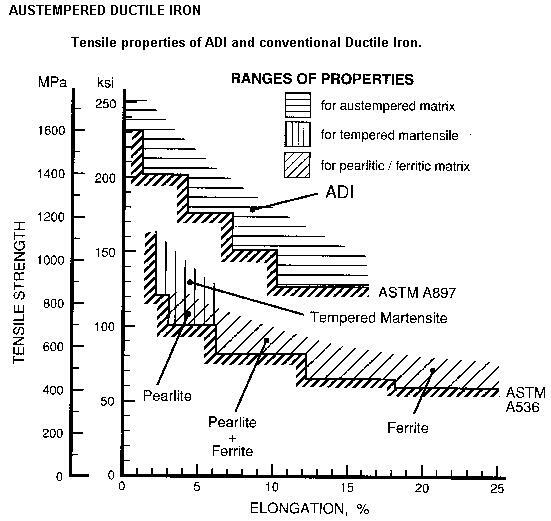 “Austempered Ductile Iron” (ADI) was invented in the 1950s but was commercialized and achieved success only some years later. In ADI, the metallurgical structure is manipulated through a sophisticated heat treating process. The “aus” portion of the name refers to austenite. Other elements such as copper or tin may be added to increase tensile and yield strength while simultaneously reducing elongation. Improved corrosion resistance can be achieved by replacing 15% to 30% of the iron in the alloy with varying amounts of nickel, copper, or chromium. 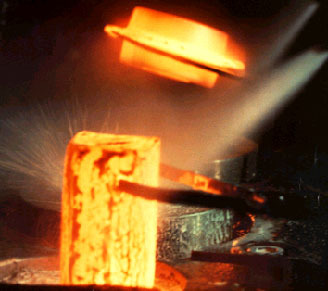 In many cases, the composition of an ADI casting differs little from that of a conventional ductile iron casting, the alteration in properties being achieved by the addition of alloys like nickel, copper and molybdenum at quite low levels followed by the austempering heat treatment. The effects of altering the alloys in ADI are summarised below. Increasing carbon in the range 3 to 4% increases the tensile strength but has negligible effect on elongation and hardness. Carbon should be controlled within the range 3.6-3.8% except when deviations are required to provide a defect-free casting. Silicon is one of the most important elements in ADI because it promotes graphite formation, decreases the solubility of carbon in austenite, increases the eutectoid temperature, and inhibits the formation of bainitic carbide. Increasing the silicon content increases the impact strength of ADI and lowers the ductile-brittle transition temperature. Silicon should be controlled closely within the range 2.4-2.8%. Manganese can be both a beneficial and a harmful element. 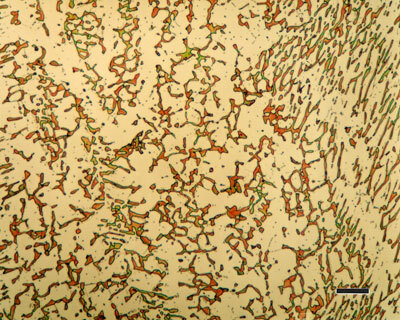 It strongly increases hardenability, but during solidification it segregates to cell boundaries where it forms carbides and retards the austempering reaction. As a result, for castings with either low nodule counts or section sizes greater than 3/4 in manganese segregation at cell boundaries can be sufficiently high to produce shrinkage, carbides and unstable austenite. These microstructural defects and inhomogeneities decrease machinability and reduce mechanical properties. To improve properties and reduce the sensitivity of the ADI to section size and nodule count, it is advisable to restrict the manganese level in ADI to less than 0.3%. The use of high purity pig iron in the ADI charge offers the twin advantages of diluting the manganese in the steel scrap to desirable levels and controlling undesirable trace elements. Up to 0.8% copper may be added to ADI to increase hardenability. Copper has no significant effect on tensile properties but increases ductility at austempering temperatures below 675°F (350°C). Up to 2% nickel may be used to increase the hardenability of ADI. For austempering temperatures below 675°F (350°C) nickel reduces tensile strength slightly but increases ductility and fracture toughness. Molybdenum is the most potent hardenability agent in ADI, and may be required in heavy section castings to prevent the formation of pearlite. However, both tensile strength and ductility decrease as the molybdenum content is increased beyond that required for hardenability. This deterioration in properties is probably caused by the segregation of molybdenum to cell boundaries and the formation of carbides. The level of molybdenum should be restricted to not more than 0.2% in heavy section castings. The presence of stable, carbon enriched austenite accounts for the wear resistant property of ADI. While thermodynamically stable, the enriched austenite can undergo a strain-induced transformation when exposed to high, normal forces. This transformation, which gives ADI its remarkable wear resistance, is more than mere “work hardening”. In addition to a significant increase in flow stress and hardness (typical in most metallic materials), this strain induced transformation also produces a localized increase in volume and creates high compressive stresses in the “transformed” areas. These compressive stresses inhibit crack formation and growth and produce significant improvements in the fatigue properties of ADI when it is machined after heat treatment or subjected to surface treatments such as shot peening, grinding or rolling. ADI is a group of materials whose mechanical properties can be varied over a wide range by a suitable choice of heat treatment. A high austempering temperature, 750°F (400°C), produces ADI with high ductility, a yield strength in the range of 500 MPa (72 ksi) with good fatigue and impact strength. These grades of ADI also respond well to the surface strain transformation previously discussed which greatly increases their bending fatigue strength. A lower transformation temperature, 500°F (260°C), results in ADI with very high yield strength (1400 MPa (200 MPa)), high hardness, excellent wear resistance and contact fatigue strength. This high strength ADI has lower fatigue strength as-austempered but it can be greatly improved with the proper rolling or grinding regimen. Thus, through relatively simple control of the austempering conditions ADI can be given a range of properties unequalled by any other material. Advantages of Austempered Ductile Iron : ADI provides high strength, good fatigue properties, superior wear qualities, excellent toughness, and cost-effectiveness. 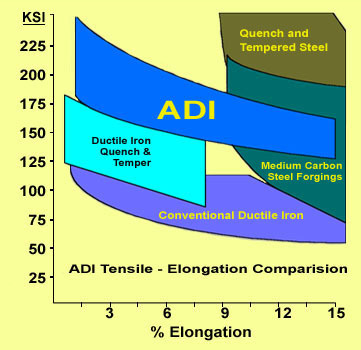 Tensile and Yield Strength : ADI’s tensile and yield strengths are at least twice those of standard ductile irons. Fatigue Strength : ADI’s fatigue strength is typically 50% higher than that of standard ductile irons. It can be further increased by shot peening or fillet rolling. The lower hardness grades of ADI work well in structural applications. Toughness : ADI’s excellent impact and fracture-toughness properties make it ideal for applications such as ground-engaging tools. Wear Characteristics : The higher hardness grades of ADI are excellent for wear applications. Unlike case-hardened materials, typically the ADI is uniformly hardened throughout the part. Also, ADI work-hardens when stressed. This produces a surface of very hard martensite where wear resistance is most needed. Cost-effectiveness : ADI is usually 15% to 20% less costly than steel forgings or castings. It is the most economical way of obtaining tensile, yield, or fatigue strength. ADI often competes favorably with heat-treated and alloy steels for heavy-duty applications where reliabilty is crucial. It is a useful upgrade from standard grades of ductile iron. In some cases it replaces manganese steel and nickel-chrome iron. Because of ADI’s high strength-to-weight ratio, it has even replaced aluminum where the design allows reduced section sizes. I’d appreciate that appliedprocess.com be included in your references for ADI as you used our components photo and a still shot of our video in your article on Austempered Ductile Iron. Thank you, in advance, for your consideration in this matter. Also, your ADI microstructure is a Grade 800 ADI that undergoes an inter-critical austenitizing, hence the pro-eutectoid ferrite evidenced near the nodules.